How have recovery funds helped businesses damaged in Ferguson protests? After Cafe Natasha was vandalized on Nov. 24, artists painted murals on the boarded-up windows. The owner of Cafe Natasha said relief funds, as well as support from the community, helped bring the restaurant back in business. While many businesses damaged during Ferguson-related protests have received help, their experiences and prospects for full recovery vary by neighborhood. For roughly 30 years, Café Natasha owner Hamishe Bahrami has served up succulent falafel sandwiches and sumptuous osh to hungry folks on St. Louis’ South Grand Boulevard. But Bahrami won’t forget what happened to her eatery on Nov. 24. That's when a grand jury decided not to indict former Ferguson Police officer Darren Wilson for the death of Michael Brown. In reaction, vandals smashed nine of Café Natasha’s windows. Bahrami said it cost thousands of dollars to board up and replace them. But Café Natasha’s misfortune was short-lived. Fans of the Persian restaurant flocked there to support Bahrami and her family. And she also received assistance from the Small Business Relief Program, which provided her business with a $1,500 no-interest loan that proved helpful in repairing the damage. Since Michael Brown was shot and killed last August, several relief funds have provided hundreds of thousands of dollars to businesses affected by the unrest. The funds have helped stabilized neighborhoods like South Grand. But those efforts may not be enough in Ferguson and Dellwood, which sustained the lion’s share of damage after the grand jury decision. Some see a need for a much broader effort to save a once-promising business corridor from taking a turn for the worse. Mohamad Yaacoub, owner of Sam's Meat Market & Liquor and co-owner of New York Grill, says the amount of money provided by relief funds is just not enough to help his business. And while policymakers said they’re trying to seek out more resources to help north St. Louis County, time may be of the essence. In the weeks and months following protests throughout the St. Louis region, public and private groups set up several relief funds to help businesses. One of these initiatives is the Small Business Relief Program, which has divvied out around $700,000 of no-interest loans to about 60 businesses. It also includes the Reinvest North County Fund, which has provided around $300,000 worth of grants to businesses and schools in north St. Louis County. The relief program was a combined effort of governmental entities like the St. Louis Economic Development Partnership and business organizations such as the St. Louis Regional Chamber. Partnership President Rodney Crim said the fund’s work has made a difference to struggling businesses. To see what Zoll means by “a challenge,” look at the portions of West Florissant Boulevard that run through Ferguson and Dellwood. That street was often ground zero for violent protests after Brown was killed. New York Grill in Dellwood reopened after sustaining some damage after the riots and unrest. But the owner of the eatery says business is down -- primarily because the customer base has dried up. Scores of businesses there were burned and looted after the grand jury decision. The charred remains of these businesses still stick out to potential customers. This setting is proving to be a major problem for New York Grill, a Dellwood restaurant that received a $15,000 no-interest loan from the Small Business Relief Program. The eatery’s co-owner, Mohamad Yaacoub, said few people want to partake in shish kabobs or gyros while staring at rubble. “We lose a lot of money because nobody comes in here,” said Yaacoub, who is also the owner of Sam’s Meat Market in Ferguson. Kanzler said Yaacoub’s plight showcases the weaknesses with some of the relief funds. Even though some of the more severely damaged buildings have insurance, Kanzler said getting payouts isn’t an automatic process. And that can have major consequences for businesses like the New York Grill. Attorney Jay Kanzler represents a number of business along West Florissant Avenue. There are other issues: Many of the businesses took no-interest loans in August when rioting was less severe. Few are interested in going into more debt when they don’t have a steady income stream to pay the money back. And more importantly, Kanzler said, the money being offered to the businesses just isn’t enough – especially since some companies sustained tens of thousands of dollars worth of damage. “And if the people that do the shopping, that buy the tires, that heat the fire, that purchase the groceries, that visit the doctor – if they don’t come back, then all the individual efforts to rebuild will be for naught,” he added. Rubble from a building near New York Grill. When asked about concerns that the relief funds aren’t impactful enough, Crim said that his group is moving expeditiously to try to get more resources. In addition to hundreds of thousands of dollars from St. Louis County to help demolished burned-out buildings, Crim said his organization is working with the state to receive U.S. Housing and Urban Development funds that could help Ferguson and Dellwood. Crim said his fund could provide about $300,000 more in no-interest loans and some grants to businesses. Zoll said the Reinvest North County fund still has about $300,000 to distribute. But Zoll said more needs to be done. Gov. 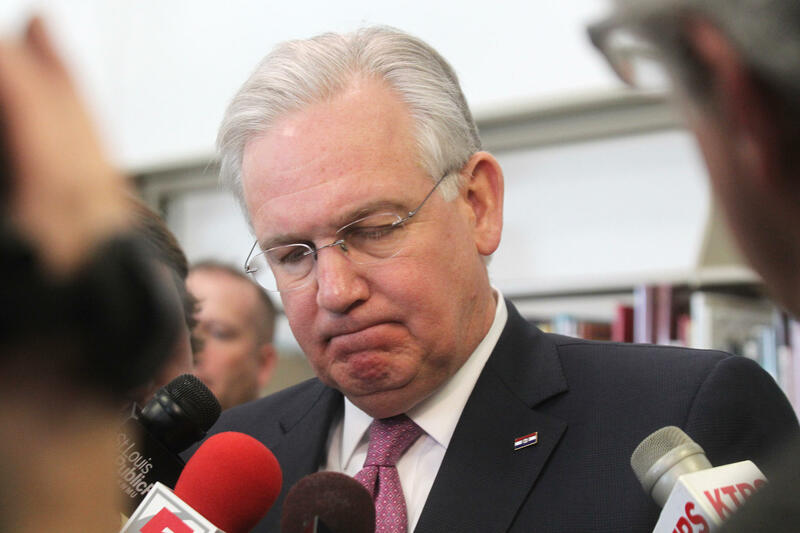 Jay Nixon's decision not to deploy the National Guard in November means that the state should step up more to help businesses, Kanzler said. "It’s absolutely his fault that the damage that occurred that evening happened. I don’t think anyone with a bit of intelligence doubts that," he said. Cafe Natasha is fully repaired and receiving a steady stream of business from patrons hungry for delicious falafel sandwiches. She wants policymakers to pick up the pace of recovery efforts. After all, she said, the fate of her fellow business owners may depend on such urgency. “I think they should get on with it as fast as possible instead of finding excuses,” she added.